The day was much like any other for this time of year- oppressively hot and sticky. I was here trying to locate a man by the name of Rosenberg - Dr. Johannes Rosenberg. Once a big shot violinist in the concert world - now apparently retired in the town of his birth, right here in Australia. After months of international investigations, I had finally tracked him down to this little town of Wagga Wagga - deep in the outback of New South Wales. Well where was he? I kicked up a little dust as I edged down the main street. It was close to midday and there was nobody around. The place looked like nothing had changed since the Body Line Series. that I had walked into a black hole. I could see absolutely nothing. It took my eyes exactly five minutes to adjust from the brilliant light outside to the dark qualities of the Wagga Wagga Grand Hotel. The sound of the huge fan in the ceiling was so loud that I had to shout at top volume my enquiries concerning Rosenberg. Nobody took any notice. No one's head even twitched an inch from the eyes straight ahead position. I left and started to make my way back down the street - then I saw him. At first I thought it was someone mowing the lawn, but I dismissed the idea immediately - there was no grass around here, hadn't rained in years. He was pushing some sort of music apparatus. As I later ascertained, it was the triple neck, double piston, wheeling violin - natürlich! Slowly, facing off and at some distance, we gradually approached each other. Closer and closer we came with increasing probability. I assumed he had seen me but obviously not - as we passed each other like cliches in the night. He was wearing a pink suit - body and head bent slightly forward under a huge black hat, his eyes transfixed on some far-out point in the far-out future; intensely he concentrated on the music. I swung round and moved alongside the violinist. We moved on down the track together for a while. A long while. Nothing was said. I observed with great interest how the bowing of the good Doctor was completely post modern in character. The double bow action maintained a regular arpeggio while Rosenberg's fingers, from both left and right hands, achieved astonishing independent enharmonic structures with a high degree of tonal ambiguity. Suddenly he spoke and announced that he had just finished performing his 1941 composition entitled 4 Kilometres; 33 Metres. He also noted that the quality of the road surface had given rise to some interesting spiccato effects in the bowing. He pointed out that for a retrograde performance of the whole piece, we would have to walk the entire four kilometres and 33 metres again - but backwards. Luckily for me, the 69 year old Doctor decided against it on this particular day. That is perhaps how he got his nickname around here as play it again, doc. My name's Lipinski, by the way, Igor Lipinski. directly overhead, our shadows projected on the road in front of us. To the left and right a gum or a bush occasionally interrupted the endless flat plain. There was no wind and nothing seemed to move. "Let's talk about the Second Viennese School of Composition" he said. "all my research and concepts have also been stolen. For example where do you think John Cage got the 4 Minutes 33 Seconds idea from? What a scoop, no? And as for John Coltranes's Sheets of Sound' concept, I was there with his wife Alice putting out the washing when the idea came to my mind. And, comrade, let's not forget the Beatles, remember I gave them violin lessons in 1965 -along with some Zen and other stuff. Yes, quick as cosmos, there's John Lennon using a segment from my 9th Violin Concerto on the White Album -called it Number 9 of course." Rosenberg then launched into a very long speech about theft in music history. He is quoting examples from just about every style of music in the world: From Johannes Brahms to Johnny Cash to John Birks, Dizzy' Gillespie to Johnny Frank Sinatra. From Joheinz Stockhausen to Javi Shankar to Jichel Jackson. I can tell you, readers, there was nothing left for conjecture. "Let's take for example thematic theft -like the main theme from the last movement of Mozart's Jupiter Symphony - which was stolen for Handel- which was stolen for Corelli - which was stolen from Anon. Period. Or the stylistic theft of Donovan from Arlo Guthrie, from Robert Zimmerman, from Woody Guthrie, who took it from wee Jock McJody of Aberdeen. Or theft in the name of education, like the totally disgusting Jamie Abersoll who financially exploited the music of Charlie Parker. Or even the theft of musician's artifacts and personal features. For example, Beethoven's death mask was immediately copied and these copies were distributed worldwide - masquerading as original. Indeed, one went to Australia wrapped in Beethoven's very own jacket. And I'm wearing this very jacket, right now." As the shadows lengthened, we walked on, the music from the wheeling violin became for me like a mantra from a holy man. The Doctor was just in the middle of connecting the Solomon Island tradition of counterpoint in major seconds with the late works of Schoenberg when he paused for about 400 metres. Then he said to me "sink a few tubes". I asked for a translation into English. Like a miracle, a couple of ice cold cans of beer appeared from the side of the triple neck, double piston, wheeling violin. "Occasionally I use this particular violin to round up sheep. It's a bit of extra performance work I do. 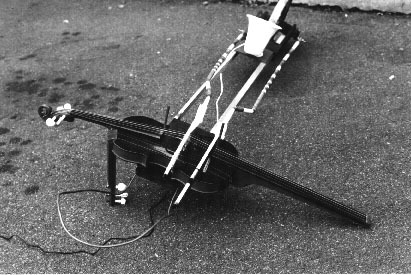 I had to find a reasonable solution to problems of dehydration while working those long hours, hence the refrigeration unit on the violin. It's also good for chucking wheelies." For a man who had the world at his feet, both as a concert violinist and, literally, by being the first violinist to climb Mount Everest - did he have any regrets? Yes, there was one. In the early 70s the Australian Research Department of the CSIRO had invited him to perform solo to 10,000 penguins in the Antarctic - part of a behavioural study on concert audiences and temperature. Performing to this well dressed audience was an inspiration. Rosenberg played a series of -40 degree C concerts, but the effect on the environment was disastrous - as we now can perceive by the damage to the ozone layer.